217 arts and culture professionals, scientists and campaigners have signed a damning letter in today’s Times, calling for BP’s new 5-year sponsorship deals with the British Museum, National Portrait Gallery, Royal Opera House and Royal Shakespeare Company to be cancelled. The signatories argue: “These institutions’ decisions are badly out of step with the mood of their own staff and audiences”. 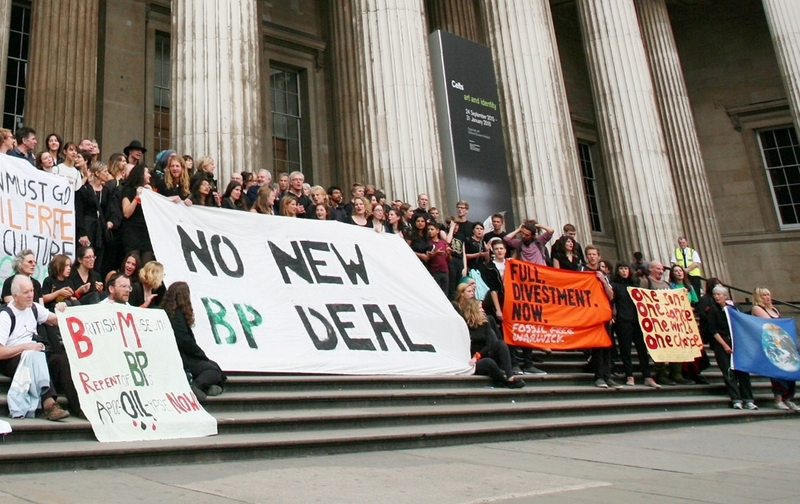 The announcement of the new deals last week was met with condemnation from campaigners and an assurance that protests and art interventions against BP sponsorship would escalate - including a public ‘Splashmob’ in the British Museum in September. Prominent signatories include actors Mark Rylance and Ezra Miller, writer and activist Naomi Klein, Nigerian poet, campaigner and winner of the Right Livelihood Award (Alternative Nobel Prize) Nnimmo Bassey, environmentalists Jonathon Porritt and Bill McKibben, composer Matthew Herbert, artist Conrad Atkinson, climate science historian Naomi Oreskes, and West Papuan independence leader Benny Wenda. Campaigners after a 200-strong protest performance at the British Museum, September 2015. Photo by Anna Branthwaite. Earlier this year, BP’s 26-year sponsorship of Tate and 34-year sponsorship of Edinburgh International Festival were ended, following years of protests, art interventions and dissent from prominent artists and performers. BP claims its sponsorship comes with ‘no strings attached’ but internal emails released by the Art Not Oil coalition have shown this to be untrue. In 2015 BP leant on the British Museum to host a Mexican “Days of the Dead” festival where it was able to meet with members of the Mexican government just weeks before bidding for new drilling licences in the Gulf of Mexico, according to British Museum emails published in a report by the coalition in May. Other emails showed BP convened a security meeting attended by senior staff from sponsored institutions to discuss security measures for responding to peaceful protest. The Museums Association’s Ethics Committee have considered the report’s findings and are expected to issue a statement soon on whether its Code of Ethics has been breached. A performer from activist theatre group BP or not BP? at the BP-sponsored "Day of the Dead" event at the British Museum, October 2015. Photo by Diana More. From the Gulf Coast, which was devastated by BP’s Deepwater Horizon oil spill in 2010, Cherri Foytlin from Bold Louisiana and Life Support Project, and Derrick Evans from Turkey Creek Community Initiatives, Mississippi. Both have been outspoken critics of BP. Benny Wenda, exiled West Papuan independence leader. The Free West Papua campaign is running a global boycott of BP over its involvement in West Papua and collusion with the repressive Indonesian regime. Nnimmo Bassey, poet and long-time environmental campaigner from Nigeria and former Chair of Friends of the Earth International. Bunna Lawrie, a Mirning Elder-Whale Songman from Australia who is prominent in the massive campaign to stop BP drilling offshore in Nullarbor/the Great Australian Bight. Melina Laboucan-Massimo from the Lubicon Cree First Nation, who has been a high-profile campaigner against tar sands extraction and for clean energy in Alberta, Canada. Gilberto Torres Martinez, a Colombian trade union leader, who was a victim of kidnapping and torture by paramilitary groups backed by BP, and lived to tell the tale. Many Latin American solidarity networks, based in the UK and Mexico. Gilberto Torres speaks inside the British Museum, October 2015. Photo by Kristian Buus. All four institutions have seen creative protest performances critiquing their relationship with BP. Theatrical protest group BP or not BP? invaded the RSC’s stages repeatedly in 2012 when BP sponsored a series of plays there, and have now performed without permission in the British Museum 18 times - the most recent three performances being in response to BP’s sponsorship of the current ‘Sunken Cities’ exhibition. Watch films of all their performances. The group of ‘actorvists’ have announced a public ‘Splashmob’ in the museum on 25 September. Greenpeace also protested on the day the Sunken Cities exhibition opened, climbing the iconic pillars of the museum, which decided to close for several hours in response. Liberate Tate performed ‘Fifth Assessment’ at several of the institutions (British Museum, National Portrait Gallery, and Royal Opera House), where performers (including actor Ezra Miller) read out the Intergovernmental Panel On Climate Change’s Fifth Assessment report. The Royal Opera House has also seen several protests inside the auditorium and in Trafalgar Square, during different live BP Big Screen performances. Liberate Tate perform "Fifth Assessment" at the National Portrait Gallery. Photo by Martin Lesanto-Smith. BP’s announcement of five-year sponsorship deals with the British Museum, Royal Opera House, National Portrait Gallery and Royal Shakespeare Company is outdated and unacceptable. We cannot afford another five years of BP-branded culture. We believe museums, theatres and galleries are public institutions that must play a positive role in taking urgent climate action and defending human rights. If the world is to avoid rapid and devastating climate change in the coming decades, most of the oil on BP’s books cannot be burned. Meanwhile, the company continues acting in defiance of the Paris Agreement on climate change, and harming lives every day - despite community resistance from the Gulf Coast to West Papua to Australia. We know now that BP sponsorship comes with strings attached. A recent report revealed how BP leant on the British Museum to hold events timed with BP’s bid for drilling licenses in Mexico, and how the museum checked in with BP on curatorial decisions. Branding a major museum or theatre has become cheaper for BP (just £375,000 a year for each institution, on average). This is less than the cost of a short billboard campaign. Surveys show that a majority of Londoners, and the British Museum’s own staff, are against BP sponsorship. These institutions’ decisions are badly out of step with the mood of their own staff and audiences. BP is not welcome to use our culture to promote its destructive business - these deals must be cancelled. Jess Worth Writer and performer, BP or not BP?